Clavicles -- otherwise known as collarbones -- are thin bones that attach the shoulder blades to the breastbone. A break to a clavicle can occur as a result of a fall, a sports-related mishap or a car accident. To maintain optimal range of motion in your upper body with a broken clavicle you must remain physically active. Certain types of aerobic exercise and resistance training may be limited during the recovery period. While exercise is important for all adults, it can be especially helpful for those who have been diagnosed with a broken clavicle. "Helping Your Clavicle to Recover After a Fracture," a guide prepared by Oxford Radcliffe Hospitals, says that beginning -- or returning -- to exercise after a clavicle break helps to maintain normal movement and prevents joint stiffness and pain. You should include shoulder flexion, shoulder extension, shoulder abduction and internal rotation exercises in your regular workout routine. Perform 10 repetitions of these exercises three or four times per day for optimal results. 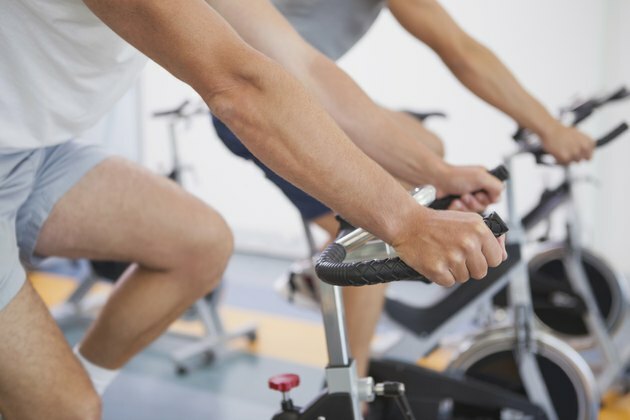 For eight weeks after the break, according to the American College of Sports Medicine, you should avoid high-intensity aerobic exercise that places significant pressure on the collarbone. This includes racket sports like tennis, squash and ping pong. Upper body resistance training should also be put on hold until the clavicle has completely healed, notes the ACSM. Squats, lunges, deadlifts, and other weight-lifting exercises that target the lower body can still be included as part of a regular exercise routine. According to Oxford Radcliffe Hospitals, a person with a broken clavicle should continue to engage in everyday activities, such as shopping, cleaning and cooking. While this may produce an increase in soreness during the early days of recovery, using the shoulder even a few days after a break will not cause further damage. Perform more strenuous tasks as shoulder soreness decreases during the healing process. It is common to experience some pain while exercising with a broken clavicle, says the ACSM. According to Oxford Radcliffe Hospitals, you will likely notice bruising and swelling in both the shoulder and clavicular area as it heals. Do not let these signs and symptoms deter your from your regular exercise routine. Icing the broken clavicle for 10 minutes three or four times a day and using painkillers can help to alleviate some of the discomfort associated with this injury.